Dunedin City, brief walk-about. Take on Baldwin Street if you love a challenge! Lunch at the Portobello Hotel, a great place to try fresh fish & chips! Pristine views of the Otago Peninsula. Photo opportunities as we tour through beautiful areas within this special part of Dunedin's landscape. 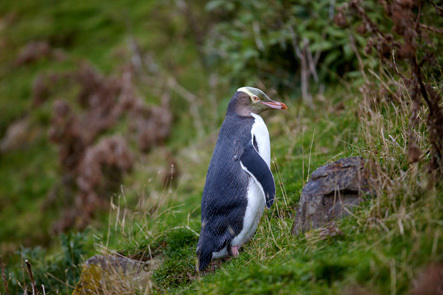 Penguin Place, a Conservation Reserve for the rare Yellow Eyed Penguin. Guided tour including a presentation on the life and ecology of the Yellow Eyed Penguin. A short bus ride over the hill to the secluded Pipikaretu Beach for a walking tour of the Penguin's habitat. There are a number of gentle steps leading into the reserve. Walking tracks are over gently rolling terrain; viewing is from an innovative series of camouflaged tunnels and hides. Entry fees to Penguin Place are included.